This chef-guided, small-group food tour takes a journey through Pacific Northwest culture by tasting Seattle’s best artisan vendors in the famous Pike Place Market. Get the inside scoop on where chefs shop and where locals hang out. Enjoy diverse tastings at 10 different places within the market and 16 different tastes— and food options like macaroni and cheese, coffee, smoked salmon, yogurt, and much more. All groups are kept to smaller sizes to ensure easier navigation of the market, more tastings, and a better platform to ask questions and interact with the group. This 2-hour food tour begins with the chef/guide's introduction to Pike Place Market. Learn about how the market got started and why it's so important to both chefs and local residents alike. The tasting tour begins at Beecher's ‘World's Best’ Mac and Cheese. Learn about the cheese-making process first-hand, then try some Fair Trade coffee and all-natural doughnuts at Local Color. Then it's on to Pike Place Chowder to taste award winning chowder; avoiding the line that wraps around the building. At Britt's Pickles, discuss their premium products and the benefits of using lactose fermentation. Elsewhere, try Ellenos Real Greek Yogurt; another chef-made tasting using MarketSpice's tea or spices; Uli's Famous Sausage and their authentic German sausage; and the Pike Place Fish Market's prized wild King Salmon Fillet. Then the tastings finish with some of the purest direct-trade dark chocolate at indi chocolate. That's 10 total stops with two chef-made tastings. 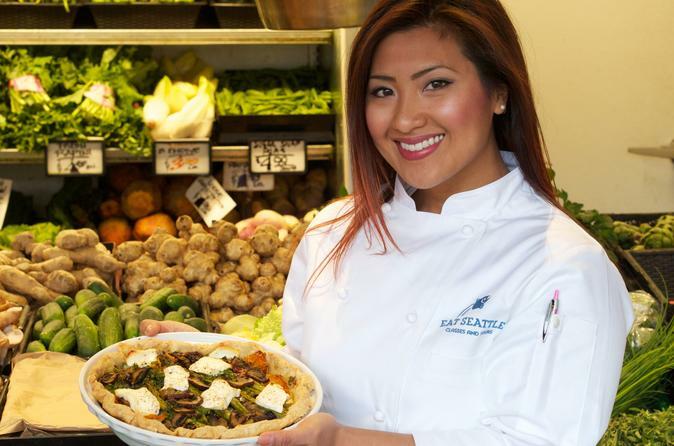 Though many tourists are attracted to the famous Pike Place Market every year, local chefs also selectively choose their seasonal produce and proteins daily from the market. This tour gives provides a taste of the vendors that supply the best chefs in town with their organic produce and sustainable seafood.